There are numerous tennis courts in the surrounding areas of Seoul, providing an affordable way for members of the public to enjoy keeping fit. It is, however, important to remember that some tennis courts are open to registered members only, and that online reservation is required for the majority of them. Most of the courts in the nearby colleges or public facilities are also open to the public at weekends. 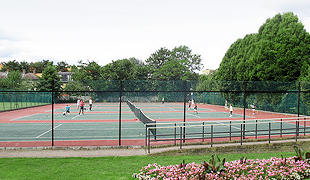 The tennis courts in Hangang Park are located in Jamwon, Ttukseom, Ichon (Hangangdaegyo (Bridge)), Yeouido and Mangwon (beweenYanghwadaegyo (Bridge) and Seongsandaegyo (Bridge)). Most courts can only be reserved online or by mobile phone. Located in Macheon-dong, Songpa-gu, this spacious facility offers hourly rates as well as monthly membership rates. On-site facilities for its nine courts include locker rooms, night lights and a spacious parking lot. Private lessons are given four times a week. Located behind Jangchung-dong National Theatre, the hard courts here are available for use on both an hourly and a monthly membership basis. Seoul Club members are free to use the courts as they are also registered as users of the Jangchung Tennis Courts.